To order Heart Physiology Science - Ion Adventure Into The Heartland, scroll to the bottom of the page. As a professional, you know the heart well... but you may be a little uncertain about the function of ion channels, ion pumps, and ion exchangers of cardiac cells. (52 Printings in English in 35 years and 42 foreign languages) explores the ionic-molecular microcosm of the heart's cells in a unique, understandable tour... and you're invited. Please allow time for images to download. * Your tour guide is Dr. Dubin as a child (from old family photos). 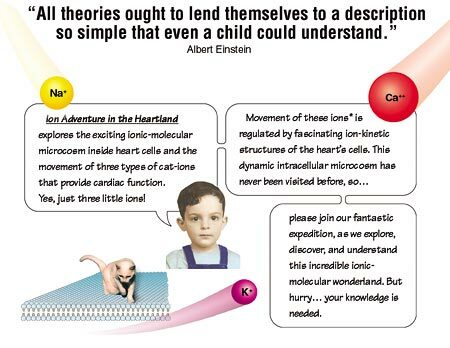 Ion Adventure in the Heartland is a "consilience" or confluence of ionic-molecular knowledge from many research disciplines correlated into a grand-unifying, functional model of cardiac physiology modulated by the autonomic nervous system. 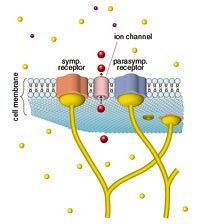 *The cat on the cell membrane (previous image) is a memory tool to remind you that these are “cat” ions (cations). Now you’ll never forget. 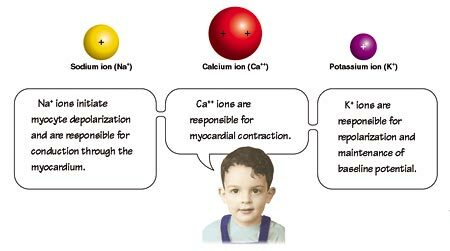 The controlled movement of three little ions is the basis of cardiac physiology. This adventure explores the ionic-molecular function of the heart, including many thought-provoking, new concepts – in a simplified, enjoyable format. The heart is the body's blood-pumping organ, and the autonomic nervous system (ANS) controls the functions of the body's organs, including the heart. 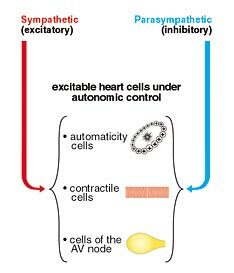 The ANS controls cardiac physiology by regulating excitable cells of the heart. The ANS regulates these heart cells through receptors that modulate certain ion-kinetic structures to influence ion movement. Concepts and mechanisms rendered as color images stay with you; easy to understand, easy to remember. Visual images last a lifetime. Your mind stores visually-linked concepts, so you own them forever.